As part of our ongoing series coming out of the EA Sports Summer Showcase, it’s high time to take a look at the biggest sport in the world. Of course, I am speaking of EA’s uber-popular footie simulation, FIFA 19. This is another transitional year for the franchise, as previous collaborators return to the fold and the action on the pitch gets one step closer to reality. Changes to the way a ball is settled is just the tip of the proverbial iceberg. Character positioning, as it relates to the position of the ball, is where the next level work is readily apparent. Angled body positioning when receiving, stretching back to pull ahead a ball trailing behind a player, and sliding to gather a pass in high traffic scenarios are just a handful of the new animations that have entered the pool. Hell, they even added in a bumper input to fake a first move, then pivot on a dime in the alternate direction. One item that had been a point of contention in prior seasons was, if I’m being completely candid, the piss poor implementation for playing 50 / 50 balls. The development team even went as far as to demonstrate the previous model, in-engine. Ultimately, whomever got to the ball first would get the settle, while the opposing player would peel off in either direction. This was primarily done in order to avoid physical contact while simultaneously blowing by the successful possessor of the ball. Quite frankly, their old implementation wasn’t true to the sport. In the real world, players go all out to win a free ball, and would frequently pay the price with their bodies. This year, players will be far less conservative on the pitch. In fact, at least based off of what I played, you might even call their play downright aggressive. The mere concept of physical contact no longer scares AI characters, at least as long as it would be consistent with the player-in-question’s tendencies in the real world. Yes, somehow EA even has a metric for aggression. Go figure. Moments of impact are even further enhanced by the updated physics modeling. When you see it play out for the first time, you too will understand why this change is such a big deal. When it comes to AI behaviors, FIFA has never been a slouch. However, the AI’s situational decision-making would occasionally leave me scratching my head. For this very reason, the updated on-the-fly tactics adjustments are a tremendous step in the right direction. Not only can you change alignments in the heat of action, but now you can also adjust the field depth of the front and back lines. If players care to spend a bit of additional time configuring tactics, there is even a series of different alignment shifts that can be initiated automatically, once a predetermined scenario presents itself. There’s even a way to train the AI to shift between alignments when transitioning between offense and defense. Scholars of the sport will LOVE this new layer to the simulation. Without question, this will fundamentally change the way people play. There’s one final system that debuts this fall that has the opportunity transform the way high-level players approach last touches. Timed finishing is a modified way to shoot that involves a double touch of sorts that hinges upon precision reflexes. If executed correctly, shots will leave the foot with increased power or a more aggressive curve. Admittedly, I was never able to accomplish a finish successfully, but from what I’ve seen, this will be one to separate the adults from the children, so to speak. What I actually experienced was the negative side of this risk/reward mechanic. Mistimed shots would end up flying wide of the target or trickle off of the foot like I had stubbed my toe in a goddamn pothole. Luckily, this is a completely optional feature that doesn’t require any configuration in order to use. Everything has been cooked seamlessly into the existing gameplay engine. 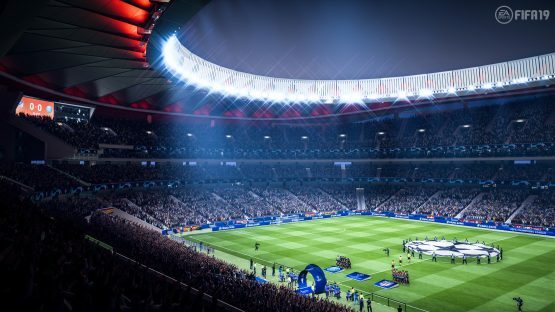 The single biggest advancement will be the return of UEFA Champions League, which had previously been a core pillar of Pro Evolution Soccer for the last decade. The last time that EA Sports had the rights to the Champions League was way back in 2007. There are countless integrations across all of the standard FIFA staples including a unique new spin on tournament mode, a whole new themed chapter in The Journey, and even special enhancements to the Kick Off mode. You can expect to learn more details on the revamped Kick Off mode and everyone’s favorite Ultimate Team iteration in a couple of weeks, right here on PlayStation Lifestyle. Until then, be sure to check out our continued coverage from the EA Sports Summer Showcase, which will continue trickling out throughout the week. FIFA 19 PS4 preview was done at an event. Travel and accommodations were provided by Electronic Arts.